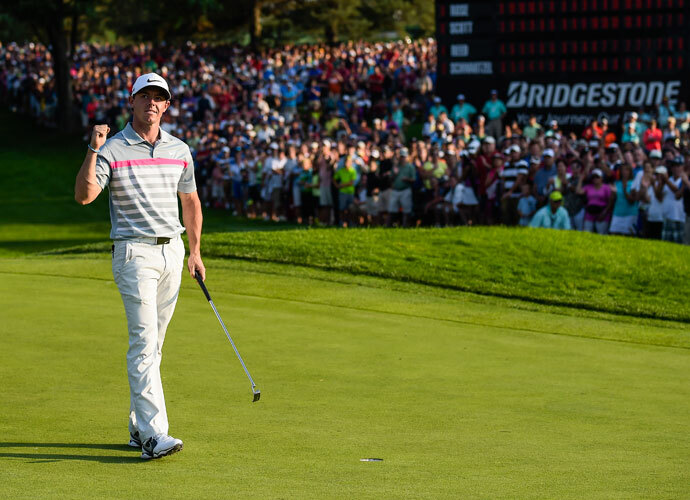 The World Golf Championships-Bridgestone Invitational happens essentially in our backyard this weekend, August 6-9. All of the golfers likely have arrived by now, and the weather looks as though it will be sunny, or at least manageable, until Monday or Tuesday, when rain is forecast. We do need that rain; the usual lush greenness of the Ohio landscape has browned a bit these past couple of weeks. But fickle weather always makes an outdoor sports tournament more interesting. The high winds at St. Andrews were evidence of that during The Open Championship, of which I caught a few snippets on TV. The Firestone Country Club hosts this week’s event every year. Although we cannot see the course from the house, my husband says the water tower is visible from the roof when he strings up the Christmas lights. And hints of the golfers’ presence come in several forms: heavy traffic, stuffed hotels, signs for volunteer parking and VIP shuttles, and the faint hum of activity and music just down the road, over a hill or two. A different sound for once competes with the usual flushing white noise of the highway not far in the opposite direction. Great blue herons, ducks, and Canada geese frequent the ponds throughout the course and go fishing, as some local humans do, in the reservoir between the metro park and the country club. They’ve got the bank by the water cordoned off to prevent such ventures this week, though the crowds farther up the road should keep all but the most stubborn geese away and perhaps more likely to replace the usual fishermen in that spot. Incidentally, I fish only figuratively. It seems as though millennia (well, one, anyway) have passed since my last fishing experience. I think it must have been with my maternal grandfather, gone for nearly a decade now. Both of my grandfathers were golfers, as are my father-in-law, my parents, and my husband. I’m the usual arm-chair observer, yet I can see how being a spectator at the invitational in person would be more exciting than watching it on TV. My husband’s been to it a few times and found the experience rather enjoyable. As I have been dwelling on many things Scottish lately–including the Gaelic language (I’m actually learning it), Scots English, learning about Scotch whiskey (and trying some here and there), the prospect of visiting Scotland, some of its politics with respect to the UK (all thanks, of course, to my obsessive love of all things Outlander this year)–I gravitate to thoughts about the game Scotland invented on this annual occasion in my home town. The origin of the word “golf,” like the sport itself, comes from early medieval times, based on the word “club.” This is “club” in the sense of the instrument used to strike the ball, as opposed to clubs of the country variety where the sport is usually played. But the players themselves are clubbers in both senses. Further tidbits about the word’s origin can be found at ScottishGolfHistory.org. “The commentary is electrifying,” he mocks, and proceeds to demonstrate the hushed tones of the usual commentators reporting from the course as the player in view is about to take a stroke at the ball. Be forewarned, if you don’t know about Robin Williams’ stand-up habits, explicit language is par for the course (sorry) and at the end of this link (hey, that’s what it’s called): The best part of Williams’ golf sketch tackles the sport’s invention in Scotland as he portrays a drunken Scotsman describing the idea and emphasizing the game’s extreme difficulty. Without my husband’s sports mania, I probably wouldn’t be aware of the golf world much at all. His usual TV programming is either soccer, rugby, Aussie rules football, golf, tennis, volleyball, track & field, Top Gear, or a political talk show such as Kennedy. (The last two are very entertaining, actually.) Although I am more inclined to pay attention to the soccer games or track & field, I, too, have come to appreciate golf’s dramatic shots, bated-breath putts (scintillating commentary or not), impossible angles, sand traps, play-offs, and the progress of great, fan-friendly golfers like Phil Mickelson. Firestone Metro Park, also nearby, is even closer to our neighborhood than the country club is. I’ve taken none of my usual nature walks this summer despite my emphasis on such things through this blog. I’ve been more home-bound out of concern for my dog Elyse’s low blood sugar patterns. So, I’m gardening mostly, and taking pictures of the results, between dosing the dog, reading, writing, and tutoring. This week would not be the time to go, anyway. The more crowded the area, the less unspoiled nature there is to enjoy. It’s a relatively popular park without a major event happening nearby, but I theoretically have the luxury of going during the typical working hours of most folks. Fall is one of the best times to visit the parks. It’s less humid, less busy, and more colorful. Bridgestone is for champions only, so that heightens the prestige compared to other golf tournaments. Jordan Spieth, Zach Johnson, who won The Open Championship (St. Andrews), and Phil, among dozens of others, will participate. I understand the legendary Jack Nicklaus attended the banquet during the event in recent years, so there are bound to be all sorts of celebrities besides. Last year’s champion Rory McIlroy will miss the tournament this time, though, due to an ankle injury. If you’re curious, you can find past Bridgestone records and highlights of the 2015 competitors on the preview page of the PGA Tour’s website. Honestly, I don’t care all that much about such details. My primary concern is to avoid the main entrance of our neighborhood between now and Monday so I don’t get stuck in a traffic jam. But I’m sure I’ll catch some of the competition on TV if my husband has anything to say about it. This otherwise exciting golf competition reminds me of the fun I’m missing as summer wanes, the activities I can’t do, and people I have loved who have passed on–family and, yes, Robin Williams. It’s a good thing my husband took me on a date tonight! It’s also good to laugh at Williams’ video clips and to unwrap the two poetry collections I just bought online by beloved poets Elizabeth Bishop and Judith Wright. Weighing the pros and cons of such a large event, though, I can’t help feeling a pride of place, knowing that celebrities and elite athletes are just a few golf strokes away. I also feel a sense of connection with Scotland and the world, through this very old tradition and its yearly spectacle in my own Akron, Ohio.